Brainy Ellie Barnett never expected to get romantic advice from the patron saint of romance writers, let alone in the middle of sophomore English class. Yet one November afternoon, as she dodges the teasing of cute-but-pesky bad boy Sam Blaine, and awaits their latest reading assignment --- Pride and Prejudice --- she hears it: a quiet "tsk" of displeasure, an ironic laugh, and a lady with an English accent talking to her. Ellie searches in vain for the source of the voice, only to discover that it’s nothing outside of her... it’s the ghost of Jane Austen, who subsequently has taken up residence in her mind. Jane refuses to tell Ellie why she has chosen to help her, but she’s honest in all of her advice. While Ellie tries to muddle her way along the increasingly jagged path through the world of serious relationships, Jane's opinionated sidebars serve as her constant companion. 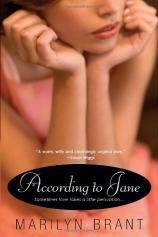 Men come and go, and Ellie learns a little bit more about herself from each relationship, often thanks to Jane. Throughout this time, Sam keeps reappearing and wreaking havoc on Ellie's life, bearing the brunt of Jane's acerbic commentary. According to Jane, Sam is Ellie's Mr. Wickham, and she refuses to acknowledge his potential for change... but is Jane's advice foolproof? Ultimately, Ellie must decide whether to follow her head, or her heart in order to find her own happy ending.